At Fibrefusion, our speciality is the design and manufacture of top quality fibre-reinforced laminated sheets and composite panels, our range of laminates is almost unlimited. We have two 400 bar (100 tonne) presses with heated platens big enough to laminate sheets up to 8ft by 4ft (2.44m x 1.22m). 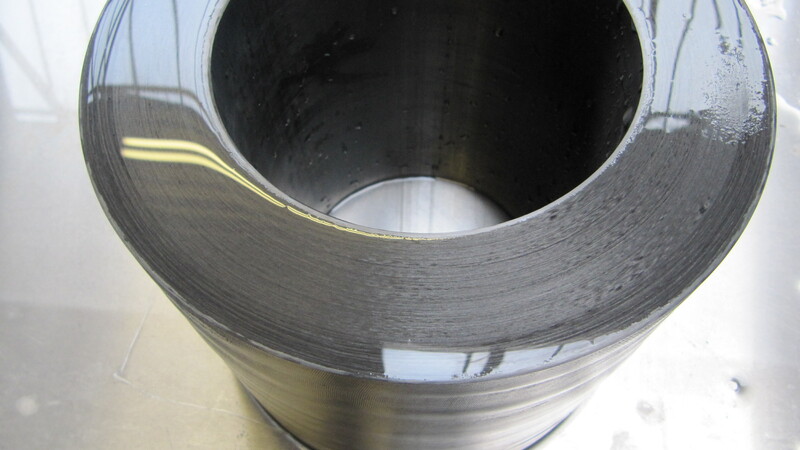 You can specify any core material from carbon fibre or glass fibre wadding to foam or super lightweight honeycomb. These can be faced with composite sheets from woven glass (in a variety of colours), carbon fibre, an aramid/carbon mix (for significantly improved impact resistance) or any other mixture. They can be finished in satin or gloss for decorative purposes or textured for construction purposes. You can even have an outer face of melamine or Formica in almost any colour or design and the sandwich can be any thickness and material combination according to your own requirements. Our laminated sheets are heat set in a vacuum or between the platens of our presses and are temperature stable up to 80 C. You can buy them as flat sheets or panels in sizes that suit you or in any shape you can imagine, cut with our in-house waterjet cutter or CNC Router to very close tolerances. We can accurately and reliably supply parts or kits of parts in any quantity. There are three components to any sandwich material; the facing, the core and the glue that holds it all together. Each of these will affect the material weight, its strength and its performance characteristics. Generally, the faces are extremely strong and the core is lightweight and very much weaker, but with the use of an excellent adhesive the benefits of both can be realised. Facing materials vary enormously. They can be purely functional or they can be purely cosmetic. Most are a combination. Facing materials are either composite or non-composite. Non-composites, i.e. timber veneers, metallic sheets, plastic sheets, melamine etc are manufactured first and then incorporated into the sandwich. Composite facings can be laminated directly onto the core material, reducing manufacturing time and finished composite panel weight, or they can be pre manufactured but many are only finally cured during the sandwich finishing process. The second part of the sandwich is the core. The core of the material performs two principal functions; it keeps the sandwich faces the correct distance apart during bending or compressive loading and it stops them from sliding over one another due to sheer loads. For this, core materials need to have suitable strength and stiffness qualities. Apart from the aerospace industry, which generally uses honeycomb or corrugated materials, the most commonly used core materials for sandwich construction are expanded thermoset and thermoplastic foams. These foams can be closed cell foams, open cell foams or a mixture of closed and open cell foam. Almost any polymer can be foamed, but the most frequently used in sandwich structures are polyurethanes (PUR), polystyrenes (PS), polyvinylchloride (PVC), polymethacrylimides (PMI), polyetherimides (PEI) and polyphenolics (PF). Some can be preformed to complex shapes before they are faced and some, such as polyurethanes (PUR), can be foamed between the pre constructed faces of the sandwich allowing even more complex shapes to be made in these materials. Although bonding of faces and core is relatively straightforward regardless of the face and core materials it is imperative for the structure as a whole that the adhesive used has excellent performance characteristics and the surfaces to be bonded are adequately prepared. Positive bonding of the faces and the core is essential for effective load transfer between them. The strength and stiffness of the sandwich material is characterised by the strength of the faces and their distance from the neutral axis of the complete system. If the adhesive fails and the faces and core are ‘debonded’, the stiffness of the system is almost entirely lost. Due to their high stability, excellent strength, creep resistance, solvent resistance and elevated temperature resistance the most popular and widely used adhesive for sandwich materials are thermosets. These structural adhesives can be loaded to near breaking point for long periods without failure and are generally epoxies. They are usually supplied in accurately premixed quantities (often pre-applied to the reinforcement fabrics) that have to be stored at very low temperatures to prevent their premature curing or they are supplied as two, self mix, liquids (a resin and a hardener) that have to be carefully metered and mixed before use. Both systems require heat to cure. The heat is supplied either by the ambient conditions or by an additional source such as an oven or autoclave, or by the heated platens of a hydraulic press and in most circumstances the application of a vacuum will improve the quality of the end product by removing air that can cause voids in the composite or unbonded areas of the sandwich. Doors, display stands, worktops Eye-catching looks for minimal expense.